An original hat using spotted cotton canvas and black denim, fully lined, and adorned with handmade fabric flowers. 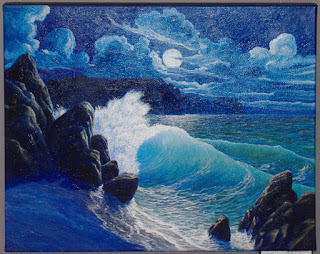 New Reasons To Visit Scattered Arts!Original acrylic painting by our talented artist and tutor, Cary McAulay - "Nocturnal Shores". A sample of items by Award Winning Porcelain Artist, Michelle Renshaw. Many more beautiful pieces available in the Gallery. "Quotes For All Occasions" by Tricia Smout. Tricia is our renowned calligraphy artist and an internationally recognised artist and crafter. Apart from cards for all occasions Barbara Merrin has snippet bags for all of your bits and pieces when sewing and lovely hessian carry bags. Ailsa McEvoy's handmade quirky toys are very popular with all children. Suitable for babies and older children.